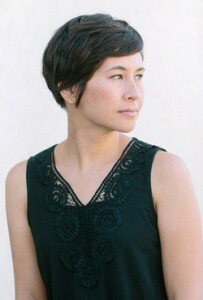 A good novel by the American Shawna Yang Ryan, published in 2016, won the following year a prestigious award, one of the American Book Awards. “Green Island” (1) is a historical novel that recounts the dictatorship of Chiang Kai-shek in Taiwan, the “White Terror” from 1947 to 1987 and it’s beginning with the massacres of February 28, 1947. Events that are necessary to know if one wants to understand the complexity of the society and the political life in Taiwan just as the difficult relations between Taiwan and China. After the 1894 war between China and Japan, the island became a model colony of Japan for fifty years with intense cultural assimilation. After the surrender of Japan, Taiwan returns to Chiang Kai-shek’s KMT China, with troops shipped by the Americans. The Nationalists considered the Taiwanese “not as rescued compatriots but like conquered adversaries” (p.13), economic mismanagement, corruption and shortages increase tensions. On 28/2/1947, an old woman who sells cigarettes on the sly, is injured by government agents; the crowd intervenes, a person is killed. Governor Chen Yi allows gunshots at the crowd, the island rose in arms; Chiang Kai-shek sends reinforcements, there will be about 20,000 victims. This is the beginning of the “White Terror” that will be strengthened after the defeat of Chiang by Mao Zedong’s forces and the arrival of nearly two million “mainlanders” in Taiwan in 1949. The end of martial law will intervene only in 1987. This 28/2, a doctor, Dr. Tsai, delivers his wife a baby who will become the narrator of the book, his fourth child. In a meeting with the authorities, he advocates moderation, he is arrested and remains alive only by nursing one of his guards; he is sentenced to ten years in prison on Green Island. 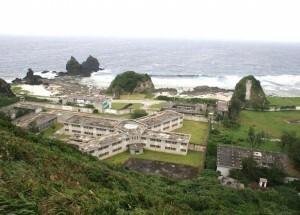 This island, located 30 km southeast of Taiwan, is small and sparsely populated. It served as a political prison for 20,000 prisoners who stayed there from 1951 to 1987. There are hardly any details in the novel on the very harsh living conditions, forced labour and epidemics. Two Penitentiary Centers, “New Life Correction Center” and “Oasis Villa” (!) which are now part of a Human Rights Park with its museum. 300 000 tourists flock to the island each year, sometimes as a pilgrimage but mainly for the corals and the beautiful beaches. When Dr. Tsai is released, he reaches Taichung where his wife has joined her family and is raising their four children. He is a totally broken man who has difficulties adapting to a family life and a small professional activity. Nevertheless, he takes care of the studies of the narrator, his favorite daughter. A few years later, she meets the son of a family friend, Wei, who is finishing a PhD at Berkeley, California. Within a few weeks, they decide to get married and she will follow him to the United States. The novelist’s mother has been a source of inspiration: from Taichung, she will have many adaptation difficulties in California. Shawna was born in Sacramento, graduated from UC Berkeley and UC Davis. From 2006 to 2013, she is a professor at the City College of San Francisco and publishes her first novel “Water Ghosts” in 2007; she is currently professor of “creative writing” at the University of Hawaii. She has lived in Taipei for several years with a Fulbright scholarship and has traveled the island extensively. Many interviews both in Taiwan and the United States, a considerable documentation work for more than ten years. “Green Island” is then published in English in 2016 and later translated into Chinese for reading in Taiwan. Taiwanese living in the United States have helped a lot because many of them have been confronted with KMT agents. Intelligence activities, espionage, corruption, under the flag of anti-communism and sometimes with a certain neutrality of the American authorities. In the novel, the narrator is threatened and then bribed by a KMT agent and a dissident, a family friend, is murdered. This episode is inspired by the murder in the United States of journalist Henry Liu, naturalized American, guilty of having published a very critical biography of Chiang Ching-kuo, son and successor of Chiang Kai-shek. Opponents to the KMT sometimes also use violence; Chiang Ching-kuo narrowly escapes an attack at the Plazza hotel in New York. What is surprising is the naïvety of some actors in the novel who underestimate the cruelty, determination, professionalism of the KMT agents; sometimes it does not seem quite credible. In this type of novel, one of the difficulties is to insert the necessary volume of historical information without boring readers who often have only minimal knowledge of the country and the period. In “Green Island”, we wish sometimes more historical references and less details on the psychology of the characters. Anyhow, this is a strong point of this novel which is read with great pleasure; characters are complex, different and are not schematic as too often found. Le choice of a female narrator is a big asset: she shows her talent in couple or family quarrels. She has hard choices to make with potentially tragic consequences; how far can we go to defend those we love? But the novel is too long even though it covers an extended historical period and several families; maybe it is too ambitious. Some secondary episodes are hardly useful for example the intervention of a school psychologist or the SARS epidemic in the hospital … Sometimes we can get a bit tired with the difficulties of the Wei couple and the narrator! Similarly, the style is sometimes too literary and not compatible with the brutality of certain scenes. Martial law ends and Taiwanese are allowed to visit China for private purposes. The following year marks the death of President Chiang Ching-kuo, Taiwan will experience political changeovers and become a democracy. 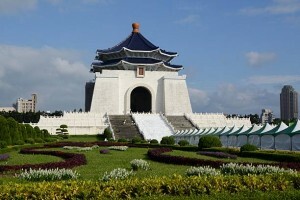 In 1997, in Taipei, a museum was opened on the events of February 28th, which is an essential step in the formation of Taiwanese identity. 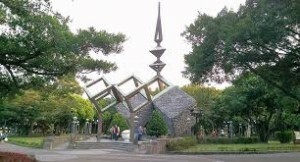 The park surrounding the museum is called “2.28 Memorial Peace Park” and features an imposing modern sculpture. 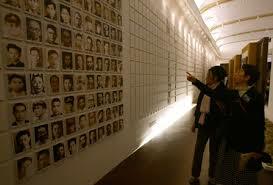 A visit to the museum impresses with the objects and photos on display and the list of missing people. A museum that was a political issue because the KMT has long refused any responsibility in the crimes of 28/2. A small museum that contrasts with the grandiose Memorial Hall of Chiang Kai-shek, visited daily by thousands of tourists who come to admire the changing of the guard in front of the huge statue in the Lincoln style of Chiang. In this mausoleum or rather this museum of personality cult, showcases 20 meters long detail the favorite dishes of Chiang! More importantly, a law has just been voted which creates a nine-member committee that has two years to establish the history of the period, to propose necessary decisions beyond the financial compensation that has often been granted to victims. 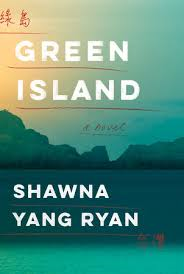 (1) Shawna Yang Ryan, “Green Island,” Alfred A. Knopf, New York 2016, 380 pages.